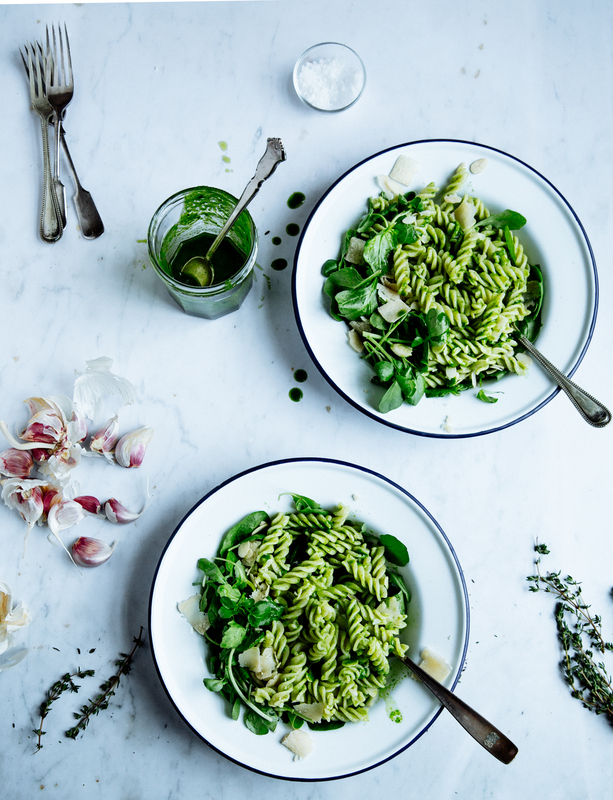 I am a little bit obsessed with this green pasta salad with parsley & thyme vinaigrette- I’ll be making it all summer long and I hope you will too. Like with any good salad, it all starts with a delicious vinaigrette- which, in this case started in the same way most of my dishes begin: with a pinch of this and a dash of that, with whatever I had in hand and thoughts of how flavours and ingredients pair nicely together. The first time I made it, I had a plate of wholewheat penne and a can of tuna to play with. As simple -and frankly- as boring as it gets. Still, I love such ingredients: they allow for infinite experimentation and can be dressed up in numerous ways, so to make them sparkly and exciting. Since I like pairing tuna with parsley and often times thyme or oregano, I used lots of fresh herbs to whizz together a creamy, loose sauce finished off with a splash of white balsamic. I’m particularly fond of the latter (as shown here too), and it makes a huge difference here too, adding a delicious acidic sweetness. This time around, I kept things even simpler- there’s no tuna, merely a sprinkle of almond flakes and parmesan shavings, along with lots of delicate fresh leaves. It really is a dish I could eat every day, both for lunch and dinner- and I have a feeling I’ll spend many summer days making jars of the dressing to use in tomato salads and grilled fish too. 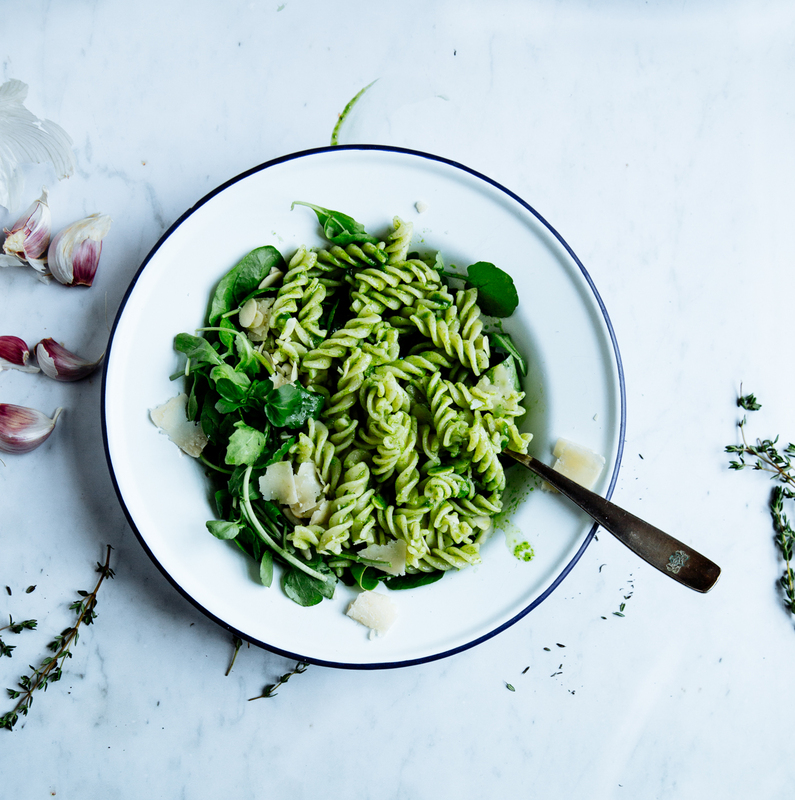 Give it shot but, as with all simple dishes, use the best ingredients you can find: a nice balsamic, good quality pasta, the freshest herbs and greens and perfectly crumbly and salty parmesan. To make the vinaigrette, add all the ingredients in a blender and blend until smooth, adding the olive oil last, gradually. Set aside. 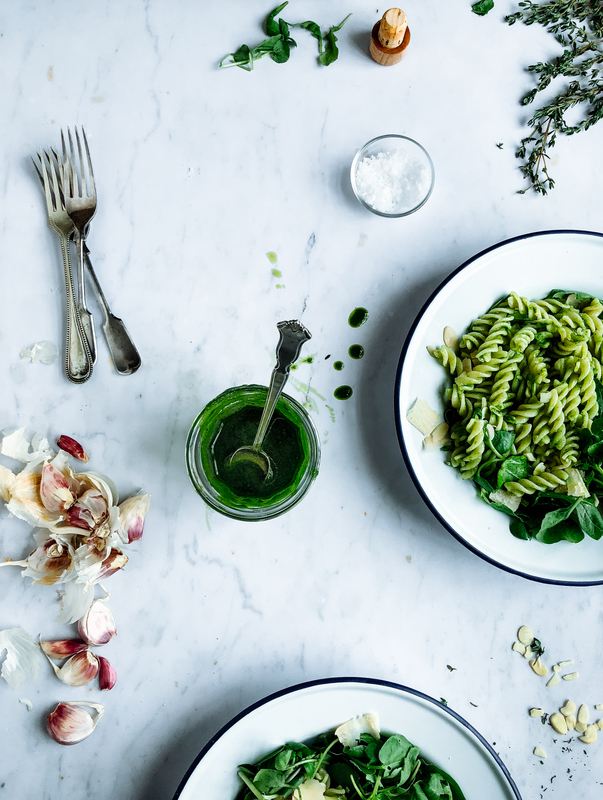 Boil the past in plenty of well-salted water until al dente. Drain and toss with half of the vinaigrette. 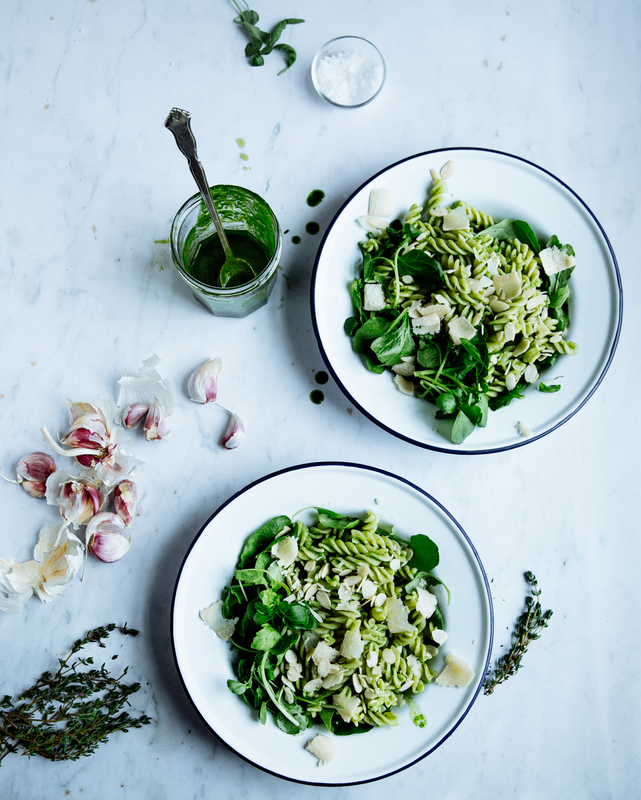 Divide the greens into plate, add the pasta and finish off with the almond flakes, parmesan and the remaining vinaigrette. * The dressing will keep in the fridge for up to 3 days.